How timely. After launching a year ago at Disrupt NYC 2011, Tracks is today releasing one of its biggest updates to date. The service is much like Color, but without the creepy factor as any and all members of a specific photo-sharing group must be invited. I like to think of it as the place where Color and Google+ Circles intersect, but I far prefer Tracks than either of the former. Thus far Tracks has offered iOS, web- and real-world versions of your tracks (the collection of photos shared with a specific social network, which can be both geo-temporal or last forever). Today, however, the service gets much more beefy, with the ability to shoot and send real-time video and the addition of new filters, Instagram-style. 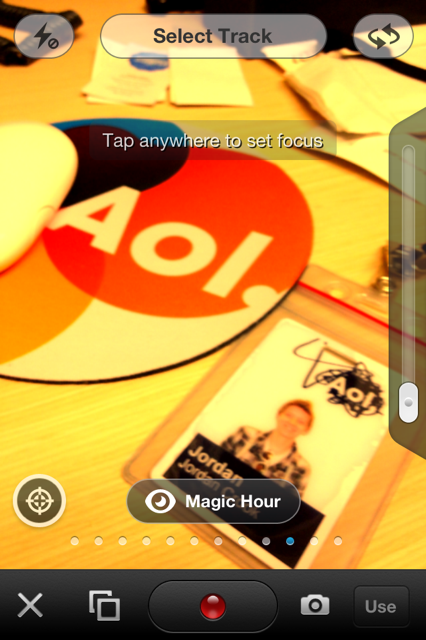 There are now ten filter options on the app, and they’ll all work on both photos and videos. But that’s not all. The update brings with it the ability to add friends to various tracks from Facebook and Twitter, as well as a new custom camera with multi-shot capability and locks for exposure and focus. Animations have also been added. Tracks has seen great success since its debut at Disrupt last year, launching an iPhone app officially in October and raising a $1 million round in December. The company also enticed Photobucket’s founder Alex Welch to join the board. Since joining Tracks as both an investor and board member last year, I have worked very closely on product and strategy with Vic and team. I continue to be impressed at the overall vision, as well as the dedication and execution of this team. As simple as it may sound, the challenge of having a single mainstream service that can span both experiences and interests with different groups of friends and family, has not been solved at a large scale. The Tracks approach is the right one. The idea of a private social network is one of the few new social ideas that I can jump on board with, and it’ll be interesting to see how the company builds out this offering with behemoths like Facebook and Twitter still growing at a solid pace.